The opening of the health insurance exchanges and the expansion of the Medicaid programs under the Patient Protection and Affordable Care Act (ACA) provided opportunities for millions of Americans to gain health insurance coverage. Still, many Asian Americans, Native Hawaiians, and Pacific Islanders (AAs and NHPIs) faced major barriers and challenges during the first Open Enrollment Period from October 2013 to March 2014. Because AAs and NHPIs represent a diverse group with many different languages and cultures, these populations faced unique challenges related to language, immigration status, and health literacy at they attempted to enroll in coverage. 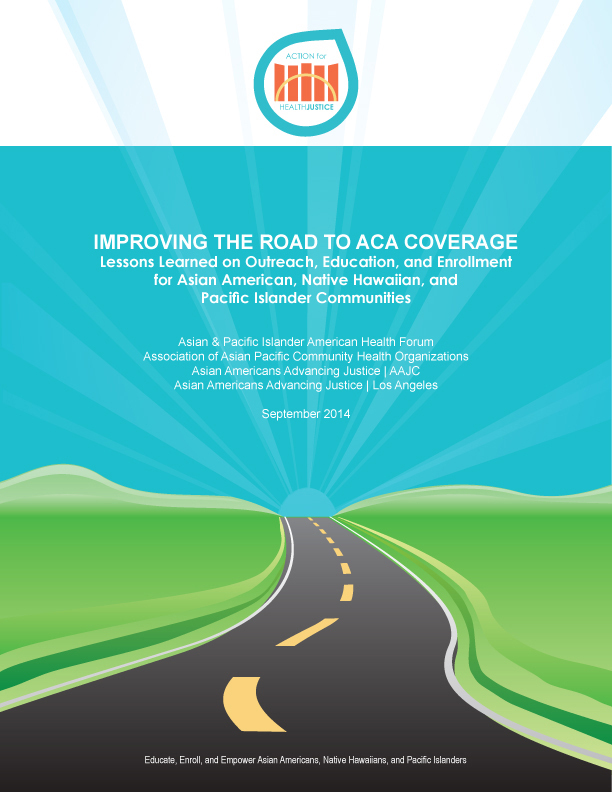 This report provides a comprehensive narrative on the activities of Action for Health Justice (AHJ) – a collaborative of over 70 community-based organizations and Federally Qualified Health Centers working in 22 states to address the challenges in ACA outreach, education, and enrollment facing AA and NHPI communities across the country.